Spiders are arthropodas belonging to the order Aranea within the class Arachnida. (not insects) Spiders have eight legs and a body consisting of two tagmata: the cepgalathorax and the abdomen. The two segments are joined together by a small pedicle. To move their limbs, spiders use hydraulics. Spiders have a very narrow digestive track and can only digest liquid food and will therefore break down their food with enzymes before eating it. Spiders are quipped with chelicerae (mouth parts) that have modified into fangs which are used to inject venom into prey, and in rare cases also into predators and other perceived threats, including humans, to protect themselves. Many people are scared of spiders and spiders with lethal venom do exist. However, most species of spiders have no worse bites than mosquitoes and only a highly allergic person will experience any trouble from these bites. The species that are dangerous to humans only bite as a last resort to protect themselves since humans aren’t considered prey. Unfortunately, it is easy to unintentionally create such a situation, e.g. by putting your foot into a shoe where a spider is resting. Despite this, the number of spider related deaths each year is low. 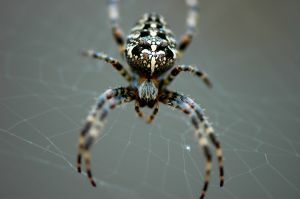 From a human perspective, spiders are beneficial creatures to have around since they keep insect populations in check. There is also promising research being made to create new medicines and none-polluting pesticides based on spider venom. Researchers are also trying to create synthetic spider web which due to its strength and flexibility would have a lot of uses. It was long believed that all spider species where predatory but in 2008 it was discovered that Bagheera kiplingi gets 90% of its food from plant matter through a symbiotic relationship with an ant species. Juvenile species of a number of spider species feed on nectar. Most spider species are however predatory feeding mainly on insects but large spiders can eat small birds, reptiles and mammals as well. There are approximately 40,000 known species of the spider divided into 109 different families. The taxonomy of spiders is under debate and a reclassification might be imminent. Most spider species are solitary animals but there are some social species that live in colonies of up to 50,000 spiders. Spiders are known from their ability to spin webs but far from all spiders do this and different spider species hunt in a variety of different ways. Spiders spin webs using appendages on the abdomens called spinnerets, which produce silk from up to six different types of silk glands. Spiders producing silk seem to have appeared during the Devonian era 386 million years ago, but these early spiders lacked spinnerets. True spiders with spinnerets have been found in Carboniferous rocks from 318 to 299 million years ago. These spiders seem to have been very similar to Mesothelae spiders. Among web spinning spiders, the webs vary a lot in shape and size, including cobwebs and orbed webs. All types of web have their own benefits and drawbacks. Other hunting techniques used by spiders include lassoing the prey with boles, running the prey down, or throwing nets on the prey. Spiders reproduce by laying eggs. The courtship is often a dangerous affair for the male as the females might eat them. Female spiders are usually larger than males and in some species much larger, such as in the case of the Black widow spider. Male spiders identify themselves and try to impress the females through a variety of different complex mating rituals varying from species to species. The eggs are deposited in silk egg cases spun by the female and each such silk egg case can contain hundreds of eggs. In many species, the female spider will carry out parental care and can carry her young on her back and share food with them. The life span of spiders is rather short and most species only survive for two years, but some larger spiders such as tarantulas and other Mygalomorph spiders can live for up to 40 years when kept in captivity under good conditions. The oldest known spider lived to become 49 years old.